Imagine an early pioneer settler, traveling across the vast prairie grasslands of the Dakotas. A strange formation comes into view that looks like a wall of mounds several hundred feet tall. There are no trees, and no vegetation in these mounds, and grass barely grow in the prairie land around it. Free land attracted the early settlers to establish homesteads as part of the westward migration. They found out they could not grow crops on this land. The mudstone mountains and the maze like topology made it difficult to travel. What good is this land? Both the Indians and the French used the term “Bad Land” to describe this area. The dryness, constant strong wind, poor soil, and harsh winter made it near impossible to establish any kind of farm or homestead. Eventually, ranching takes hold but even with the expanded allocation of 640 acres per homestead, it was difficult to make a living off of the land. Many left during the 1930s dust bowl. The mudstone is instantly recognizable as the “Badlands Formation”. It separates the lower grasslands from the higher grasslands. These “mountains” have the unique grey/white color, and stripes of red and orange. During dawn and dusk, the low angle of the sun brings out the colors in these formations. The mudstone is soft and erodes quickly so the shape of this range changes rapidly (in geological terms). We came upon the trail head area for Window, Door, Notch, and Castle trails shortly after we entered the park. The Window, Door and Notch trails were all less than two miles round trip. When I read the Notch trail was not recommended for people with a fear of heights, I said to Loretta “We must do this, this sounds like fun”. She was not so sure, since it involved a ladder. I said “You did the ladder at Mesa Verde and that wasn’t so bad” and I actually convinced her! Well, not all ladders were created equal! At Mesa Verde, it was a wooden ladder with solid rails and bolted tightly to the rock. Not so here. We started our hike meandering through the canyon of Badlands rocks with stunning blue sky and the perfect temperature of 70 degrees. Soon, we came upon THE ladder! It was three times as long as the ladder at Mesa Verde but more importantly, it was made of log steps held together by rope. While it anchored to the rock, it was very “flexible”. Despite her misgivings, Loretta was a trooper and soldiered on. Initially, it wasn’t too bad because the slope was gradual. About 2/3 of the way up, the slope got very steep and the rope seemed to be less steady. She kept her gaze up and knew if she looked down, she would lose it. She made it effortlessly! Then she said “It wasn’t so bad”. These words were premature. The Notch trail was more like a “general direction” than a trail. While the paths were well marked, there were plenty of room to go off path and explore. These rocks were soft and somewhat sandy, but the texture gripped my hiking boots well and invited me to explore. The trail ended at a notch with a stunning view of White River Valley. Getting to the notch was the easy part. The return involved going DOWN the rope ladder, but how hard can that be? Just go down one rung at a time facing the ladder, right? That was the case for most people, but not Loretta. The gap between rungs were made for “normal size” people, which, in the US, were for people around six feet tall. Loretta, at five feet, could not reach the next step down. She could not see the next rung on the ladder during the descent, which made her anxious. She had to contort herself unnaturally to reach that next rung, but eventually made it down. The descent took its toll on her and she walked funny the rest of the day, probably because she pulled a muscle trying to reach that next rung. The moral of the story: Don’t be short! We drove the Badlands Loop Road, which was stunningly beautiful. The video for the entire drive is here. We stopped by all the look outs and each of them offered a different view and perspective. Some overlooked a vast sea of Badlands hills while others looked out on grasslands and river valley. As we drove further west on Badlands Loop Road, Conata Basin Overlook and Yellow Mounds Overlook added hues of red and orange in a “painted canyon” type of scenery. The afternoon sun gave it a very comforting, warm glow and bursted with colors. The Badlands Loop Road is technically a loop, but not really. Part of the loop is Interstate 90, not particularly scenic. The portion that is in the park is stunning. The rugged beauty is reminiscent of parts of Death Valley. We came upon the Saddle Pass Trail, rated as strenuous. I said to Loretta “I know it says strenuous, but how bad can it be? It’s only 1/4 of a mile”. She reluctantly agreed as we set out on the trail. As we ascended the trail, the path seemed less and less obvious. Another couple was following us, but I said to them “I’m not sure where I’m going, so this could be the blind leading the blind”. They looked at me kind of funny, decided I was not trustworthy and turned around. Soon, the path disappeared and I had to climb on my hands and knees, going from rock to rock in a near vertical climb. I didn’t think much of it but I told Loretta to stay put while I figure out the path up. I was getting annoyed because there were no trail markings but I thought, this is OK because, after all, this was rated strenuous. After climbing, rock climbing style, without any harness, I was elated to see an arrow that marked the trail. Just as I was about to tell Loretta to follow me, I realized the marker pointed to the “real” trail and I was totally off trail. The “real” trail did not involve hands and knees, but hey, my trail was more fun! 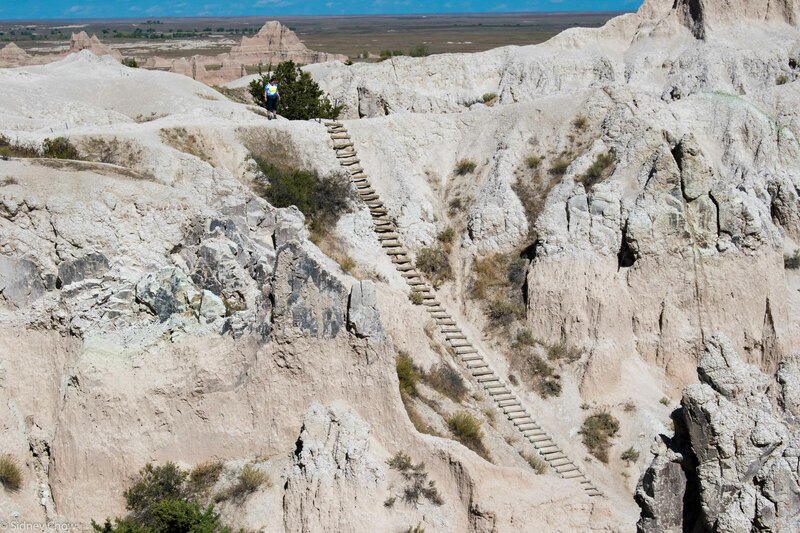 While the scenery at the end of the trail was not much to look at (it was just grasslands in the upper plateau), I felt very accomplished to climb up the Badlands “wall” the hard way! 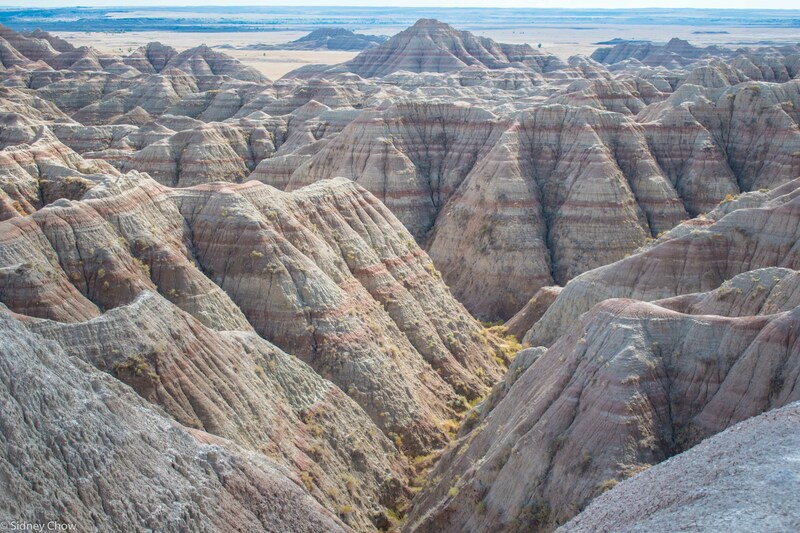 Badlands National Park teems with fossils, evidence of plentiful land and sea animals. This area was an ocean 75 million years ago before it rose up to form mountains. We walked the Fossil Exhibit Trail, which was a short, 1/4 mile boardwalk with plaques that explained the fossil history of Badlands. 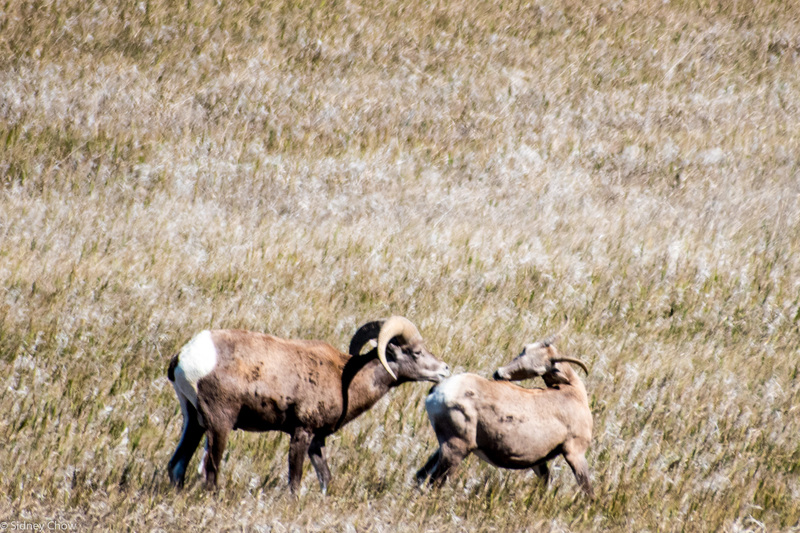 While we saw many animals during our trip, we saw a Big Horn Sheep only through the telescope of a ranger while at Theodore Roosevelt National Park. 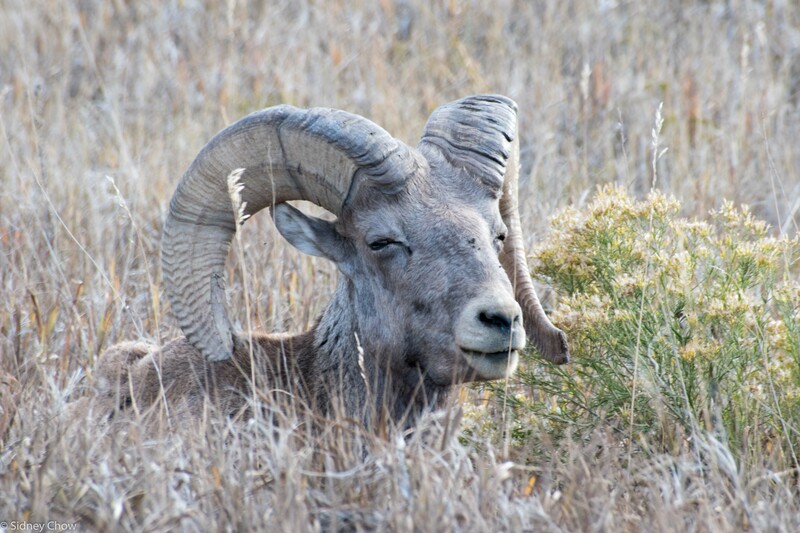 Our wish of seeing one up close was granted when we saw a Big Horn Sheep right next to the side of the road, resting and half asleep. We stopped, took a bunch of pictures as he ignored us, with eyes fluttering as if trying to keep awake. What a treat! As we drove further on Badlands Loop Road, there were a few cars stopped in the middle of the road. This is usually a great sign of wildlife! Sure enough, there was a heard of Big Horn Sheep 100 yards away, on the move. There were a couple of dozen sheep but one of them stood out as much bigger than the rest, with big, curled horn. I wondered if that was the male of the clan and the rest were females and young sheep. We stood there and just observed nature. What a treat again! There is a positive side to just about any situation, just like there is stunning beauty in the inhospitable and useless Bad Lands. Badlands National Park is easy to visit and the scenery is unique. The signature formation seems like it doesn’t belong on this earth. 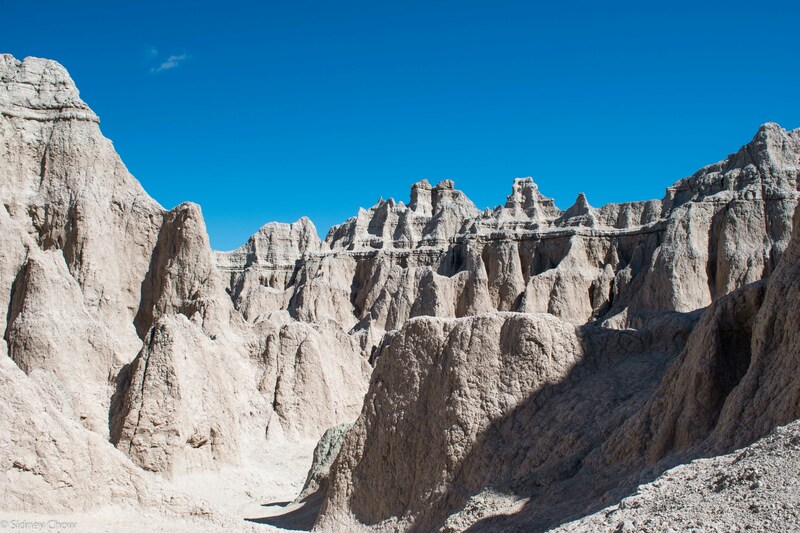 The Badlands Loop Road, with its many short trails, offers views from many perspectives. Most of the attractions are in the North Unit. There is a Stronghold Unit southwest of the North Unit that is part of the Pine Ridge Indian Reservation with only a road that skirts the southern and western boundaries. The hiking trails are fun and somewhat varied. Some thread through canyons while others were on grasslands. This is an enjoyable park to visit. 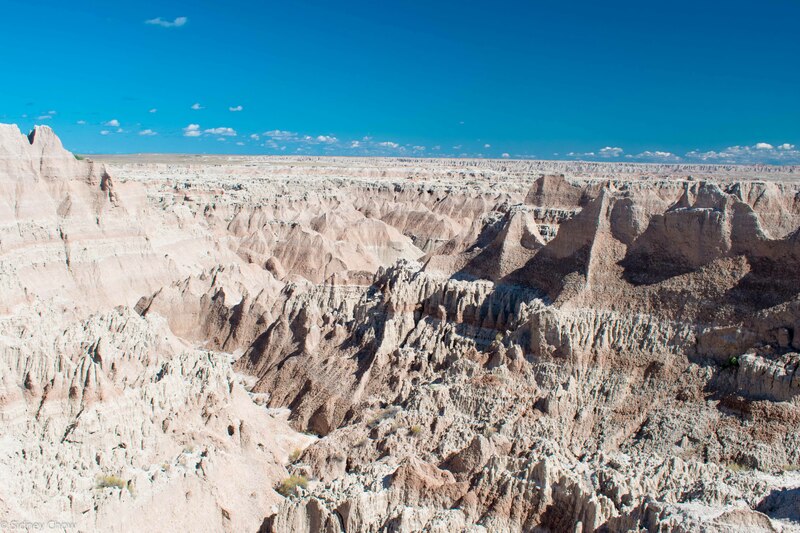 Have you visited Badlands National Park? Leave a comment below on your experience. Click on the Follow link and get an email when new postings are available. I will not share your email so no worries. 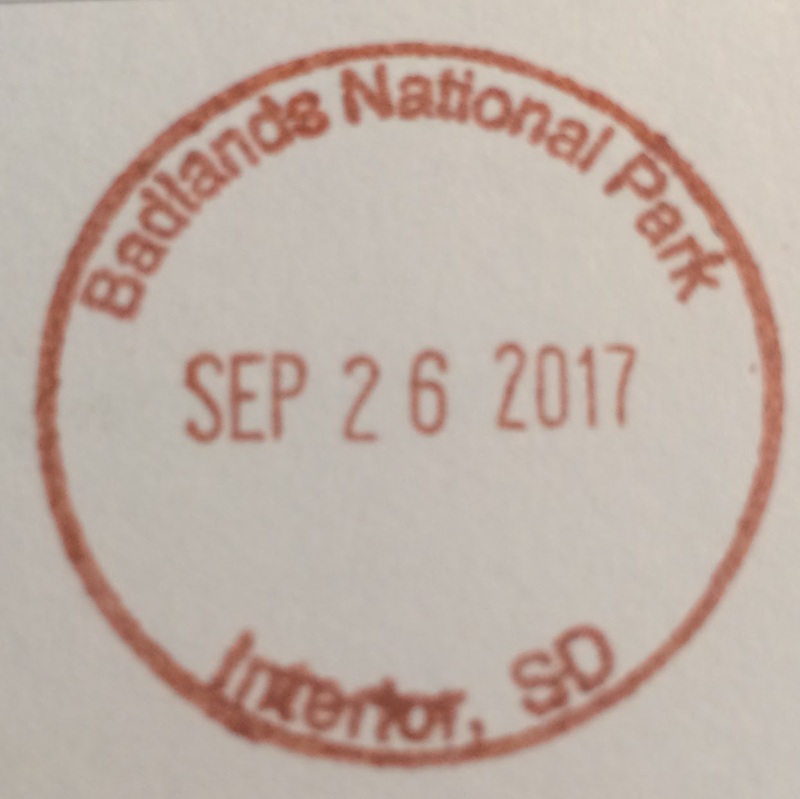 There is a lodge inside Badlands National Park – Cedar Pass Lodge – open from April to October. Rapid City is 70 miles away with excellent choice of services. It’s an easy drive on I-90 to Badlands. The town of Wall, near the western part of the park, has good services for food and gas. The scenery changes with the sun. The early morning or late afternoon sun brings out the best views. There are lots of room for back country hiking and camping, but be sure you are equipped to go into the back country. 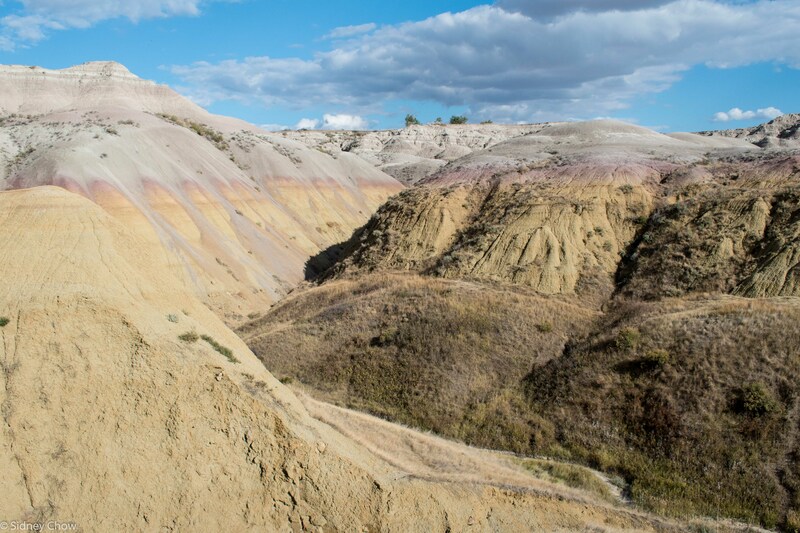 The endless mounds of the Badlands formation can confuse easily and get you lost. Previous Post:Wind Cave National Park: Why isn’t it Black Hills National Park? As I remember it, it was an ancient sea that rose up when the North America mountains rose, then because of the soft rock, it eroded over time but quickly, quicker than the harder rocks in the Rockies. The lure for westward expansion was free land, I think initially, 160 acres to every homesteader, but the more fertile land was taken so they kept moving west and came upon this desolate looking place. It’s very unique and you are right, it looks out of place for this earth. I’ve always found this part of the country to be out of place in the US. I saw this in a documentary recently with an overhead view of the landscape, and I will agree that it is beautiful but in a out of place way. It’s like there was a meteor shower that only hit this area. I am surprised early settlers even attempted to go further west rather than turn back east. We see the Grand Canyon and understand that water carved it out. We can see the Rockies push upwards to the sky as mountains. Even the Salt Lakes can be understood, but how was this part of the country developed geologically? I think the documentary mentioned it but I totally forgot.